Observation is a foundational process skill that is part of any curriculum. Each of the other science process skills requires that students first make a set of observations. This articles offers information on building key concepts for students with special needs and a corresponding activity which addresses skills essential to science--observation and the use of scientific tools. As a middle level teacher, I sometimes have to remind myself to not assume students' levels of knowledge. This is a good activity that can be modified for different grade levels on observation skills. I would adjust the objects to match the unit I will be beginning the school year with. I have done similar activities with my students in the past and by making it tie into the upcoming unit of study, it provides a glimpse of what we will be learning about. As an upper elementary or middle school activity, it also provides a good formative assessment as to students' abilities to use what the author refers to as "science tools". 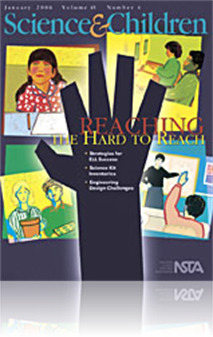 This article is written with SPED and ESL students in mind. It discusses that your need to teach a student how to observe before they can actually do it and understand what they are doing. It also emphasizes science tools that students need to understand. A basic activity is given as an example.